The first place we ever conisdered in Israel was Maale Adumim. i'll never forget the first time driving into the city... it is truly amazing. Driving throuh the different neighborhoods you cant help but be amazed at the cleanliness and beauty.... all this and only 10 minutes from Jerusalem on a great new highway! 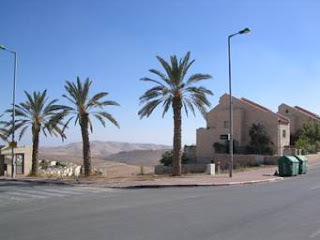 Mitzpe Nevo was the community we were most interested in, a dati Leumi community within a larger mixed city. We have continued to hear so many good things about maale adumim and mitzpe nevo, with an emphasis on the warmth of the community... Oh and mitzpe nevo has a great Carlebach minyan as well! The major iss ue for us was financial... we were initially interested in the new project in Mitzpe Nevo , but it is a bit out of our price range. If for the approximate price we could get a "second hand" home .. that would be a major consideration.. the only issue is there are very few ( if any) homes available as people dont want to leave!!! !